Pursuant to a Voluntary Compliance Agreement between the United States Department of Labor – Office of Labor-Management Standards (OLMS) and the International Association of Machinists Grand Lodge on behalf of District Lodge 141 (DL 141), signed on October 21, 2016, DL 141will conduct a new election under the supervision of the Secretary of Labor for the all officer positions, i.e. President/Directing General Chairman (PDGC), Secretary-Treasurer, Vice President – East, Vice President – West, four (4) Vice President At-Large, Vice President – Guam, Vice President – Hawaii, three (3) Trustees and twenty four (24) Assistant General Chairpersons. OLMS is responsible for assuring that the election is conducted in accordance with Title IV of the Labor-Management Reporting and Disclosure Act of 1959 (LMRDA) and, in accordance with that responsibility, has established the following rules for the supervised election. The election will be conducted, insofar as lawful and practicable, in accordance with the provisions of the International Association of Machinists (IAM) Constitution dated January 1, 2017 and the DL 141 Bylaws dated September 1, 2017. The term of office will be for four years for all positions. Section 401(e) of the LMRDA provides that every member in good standing shall be eligible to be a candidate and to hold office subject to reasonable rules uniformly imposed and to Section 504 of the LMRDA. Section 504 prohibits persons convicted of certain crimes, such as robbery, bribery, extortion, embezzlement, etc., from holding union office for a period of 13 years after conviction or the end of imprisonment, whichever is later. PDGC and AGCs must have been in continuous good standing for at least 2 years and must be working at the trade one year immediately prior to their nomination and free from any delinquencies of any nature to the Local Lodge, District Lodge or the Grand Lodge (in accordance with the Grand Lodge Constitution). All other candidates for District Lodge office shall be members in good standing in the IAM for not less than one (1) year and not less than one (1) year continuous good standing in DL 141, except the Vice Presidents must be selected from the membership they are to represent and the Vice President for the Hawaiian Area must be domiciled in the Hawaiian Islands. Further, all Officers of the Executive Board shall be employed by Hawaiian Airlines, Incorporated; United Air Lines, Incorporated; American Airlines, Incorporated; Philippine Airlines, Incorporated; Spirit Airlines, Incorporated and such other groups who become affiliated with the District. The IAM Constitution Article II, Section 4 states that the term “good standing” applies to “any person who has fulfilled the requirements for membership as prescribed herein and who has not voluntarily withdrawn therefrom, become ineligible for continued membership, or been suspended or expelled as provided in this Constitution or in the bylaws of subordinate lodges approved as required under this Constitution. Members who fail to pay their dues, assessments, or other fees within the periods required by this constitution or the bylaws of the local lodge or district lodge will be subject to automatic cancellation of membership. Members who are not in good standing are not entitled to any voice or vote or participation in any of the affairs of the G.L. or any of its subordinate bodies except as otherwise permitted under this Constitution.” Article I Section 7 states that membership shall begin on the date of initiation or last reinstatement. Section 401(e) of the LMRDA provides that in any election required to be held by secret ballot, a union must mail a notice of election to each member at his/her last known home address not less than 15 days before the election. The notice must specify the date, time, and place of the election and the offices to be filled. DL 141 mailed a notice of nomination and election to the last known home addresses of all members December 14, 2017. The notice and all attachments specifying the dates, times, and locations of the election in every local lodge is also posted on the DL 141 website, https://iam141.org/election-information. The notice will also be posted on union bulletin boards at work sites. Section 401(e) of the LMRDA provides that all members in good standing be given a reasonable opportunity to nominate candidates of their choice. It also requires that the procedures followed in making nominations be in accordance with the union’s constitution and bylaws insofar as they are not inconsistent with the requirements for a reasonable opportunity to nominate. Each local lodge will provide members in good standing the opportunity to nominate candidates on Saturday, January 20, 2018. Members will be able to make nominations between 6:00 am and 8:00 am and again between 6:00 pm and 8:00 pm. The nomination meeting locations are listed in the Notice of Nomination and Election. No quorums will be necessary. To be eligible to nominate candidates, a member must be in good standing at the time of the nomination meeting. Members classified as retired, life or exempt are eligible to nominate candidates. Nominator eligibility will be verified via the VLM database and other necessary documentation. All nominations should be accepted at the local lodge nominations meeting. If the good standing of any nominators or nominees is in question or challenged, the nomination(s) should be forwarded to the DL 141 where DL 141 Secretary Treasurer Alex Gerulis and the Election Supervisor will make the final determination on the eligibility status of any nominators or nominees. For this supervised election, eligible DL 141 members may choose submit written absentee nominations to their respective local lodge recording secretary, by mail only, to be received no later than Saturday, January 20, 2018. Hand delivery of a written nomination is not permitted. A standardized nomination form was included in the combined nomination – election notice mailed to all members in December 2017 and is also posted on the DL 141 website. However, the form is not required if all of the required information is provided. Members seeking to make a nomination by mail will be subject to the same criteria as the absentee ballot eligibility requirements as listed in DL141 Bylaws Article VIII, Section 10 and detailed in Section 9 of these instructions. All nominations, whether mail-in or in-person, should include the following information or the nomination may not be accepted: the nominator’s name, Local Lodge and book number; and the candidate(s) name, Local Lodge, book number, and the position for which the candidate is being nominated. The nominee and nominator must be in good standing. No nominee may be a candidate for more than one office. Self-nominations are allowed. No seconds are needed for nominations. An individual member may nominate fewer than the required number of candidates for each position. The mail envelope containing the Notice of Nomination and Election will list a member’s Local Lodge number on the addressee mailing label. Written nominations from eligible members will be applied to their respective Local Lodge number as indicated in the VLM database on the date the mailing list is generated for the Notice of Nomination and Election nomination notice. Each local lodge must notify DL 141 of the results of its nominations electronically on Saturday, January 20, 2018 via e-mail or fax: (844)344-0060. The deadline for local lodge recording secretaries to submit written nominations to the DL 141 Secretary Treasurer via express mail is within five business days of the nominations meeting; January 26, 2018. Each local lodge shall endorse no more than one candidate for each officer position. In the event that a local lodge has contested nominations, local lodge members in good standing will vote by secret ballot for the nominee(s) to be endorsed by the local lodge. DL 141 will post the nominations results and information regarding the local lodges requiring endorsement votes on the DL 141 website per past practice. The endorsement vote at local lodges as required will take place by secret ballot on Saturday, February 10, 2018 from 6:00 am until 8:00 am and again from 6:00 pm until 8:00 pm. The nomination meeting locations are listed in the Notice of Nomination and Election. Members will be required to present a photo ID to an inspector of election and sign the voter eligibility list before receiving a ballot. Per the DL 141 Bylaws, Article VIII, Section 8.d., the candidate order on the nomination endorsement vote ballot shall list the incumbents first and then all remaining candidates in alphabetical order. Members who meet the absentee ballot criteria outlined below will be allowed vote in the endorsement vote by absentee ballot. The District Lodge 141 Secretary Treasurer must receive all absentee endorsement ballots in the mail to a dedicated P.O. Box no later than 12:00 p.m. Saturday, February 10, 2018. Absentee ballots for the endorsement vote will be tallied at DL 141 under the supervision of the Department of Labor. Therefore, no official endorsement results will be available at the close of the February 10, 2018 tallies conducted at the local lodges. Local lodge recording secretaries should contact DL 141 the day of the endorsement vote to determine if any absentee nomination endorsement ballots were cast for their lodge. Each local lodge must notify DL 141 of the results of its endorsement votes electronically on Saturday, February 10, 2018 via e-mail or fax: (844)344-0060. The deadline for local lodge recording secretaries to submit written endorsement results to the DL 141 Secretary Treasurer via express mail is within five business days of the tally; February 16, 2018. Local Lodge endorsements will be determined by a plurality of votes for each contested District Lodge office. In the event of a tie, a recount will immediately take place and if still tied, a DL 141 teller will conduct a coin toss to determine the winner. Per DL 141 bylaws, Article VIII, Section 8.g., the DL 141 Secretary Treasurer shall immediately upon tabulating the endorsements notify all nominees of the results of this tabulation by express mail. Results will also be reported back to the local lodges and reported on the DL 141 website. The nominees, after receiving notification, shall advise the Election Supervisor and DL 141 Secretary Treasurer by close of business (COB) Friday, April 13, 2018, by express mail, of their acceptance or rejection of the nomination. If no communication is received from a nominated candidate, the nominee shall be deemed to have declined the nomination. Any nominee receiving endorsements from at least four (4) local lodges or more and accepting the nomination shall be a bona fide candidate and have his/her name placed upon the ballot. The District Secretary Treasurer shall immediately notify all nominees by express mail that their names shall appear on the ballot. Voting will occur at each local lodge polling site from the opening to the closing of the polls on Friday, June 8, 2018 from 6:00 am – 6:00 pm. Any member standing in line to vote at the close of the polling hours will be allowed to cast a ballot. Members who request an absentee ballot and meet one of the reasons for voting an absentee ballot will be permitted to vote by absentee ballot. The DL 141 Secretary Treasurer and the Election Supervisor shall prepare the ballot and have printed thereon the names of all eligible candidates, together with the book number and the local lodge of which they are respectively members at the time of nominations no later than May 1, 2018. In compliance with DL 141 Bylaws Article VIII, Section 9.c., candidate names will be arranged in order according to the number of endorsements received by each candidate for each office stated. DL 141 will supply all local lodges with an eligibility list, tally sheets, and a sufficient number of ballots for all DL 141 members in good standing to cast a vote. Members will be required to present a photo ID to an inspector of election and sign the voter eligibility list before receiving a ballot. Good standing will be verified by the local lodge membership list. Members should bring their nomination/election notice to the polls, since the notice has their card number and will assist in verifying their eligibility. Anyone whose eligibility cannot be determined will vote a challenged ballot. Voting booths or separate areas will be set aside so that members mark their ballots in secret. Members shall then place their voted ballots in the ballot box. If a member spoils the ballot he or she receives, the inspector will provide a replacement ballot. The spoiled ballot will be voided and kept with the election records. There is no voting by proxy or write-in candidates, and no member is allowed to fill in the ballot for any other member. Votes cast for candidates not nominated in conformity with these provisions (write-ins) will not be counted. The DL 141 Bylaws Article VIII, Section 1 provides for the PDGC to appoint three tellers to assist in conducting the election. The DL 141 tellers are Leonard Ursitti, William Salo and Rudy Asuncion. The DL 141 Bylaws Article VIII, Section 11 provides that each local lodge president shall appoint at least three election tellers in May 2018 to facilitate the June 2018 polling. Members who (1) reside more than 25 miles from the designated nominating/balloting; or (2) are at work during the times of the local lodge nominations or balloting; or (3) are confined because of illness or injury; or (4) are on leave qualifying under family leave law; or (5) are working members on vacation or retirees more than 25 miles away from their residence on election day; or (6) are on official IAM business; or (7) are on employer travel assignment; or (8) are on military leave, may nominate, participate in the endorsement vote, and/or vote in the election by absentee ballot, upon request. Eligible DL 141 members may choose submit written nominations to their respective local lodge recording secretary, by mail only, to be received no later than Saturday, January 20, 2018. The local lodge mailing address was provided in the combined nomination – election notice and may not be the same at the local lodge voting location. The local lodge recording secretary or his/her designee is responsible for insuring that all written nominations are received by collecting the mail after the last local mail delivery time on the Saturday, January 20, 2018. Date stamping the written nominations that are received is recommended. A standardized nomination form was provided in the combined notice mailed to all members but the form is not required if all required information is provided in writing. Qualifying requests for nomination endorsement ballots will be mailed a ballot with instructions, as they are received and verified. Voted absentee endorsement ballots must be received in the mail by the District Lodge Secretary Treasurer by 12:00 p.m., February 10, 2018 at the address indicated in the ballot instructions. Absentee ballot requests that are received after 3:00 p.m. June 4, 2018, will not be accepted. Voted absentee ballots must be received at the address listed on the ballot instructions by June 8, 2018 at 3:30 pm Central Time. Due to the breadth of DL 141 members across the United States and certain U.S. territories, members should submit absentee ballot request forms as soon as possible. 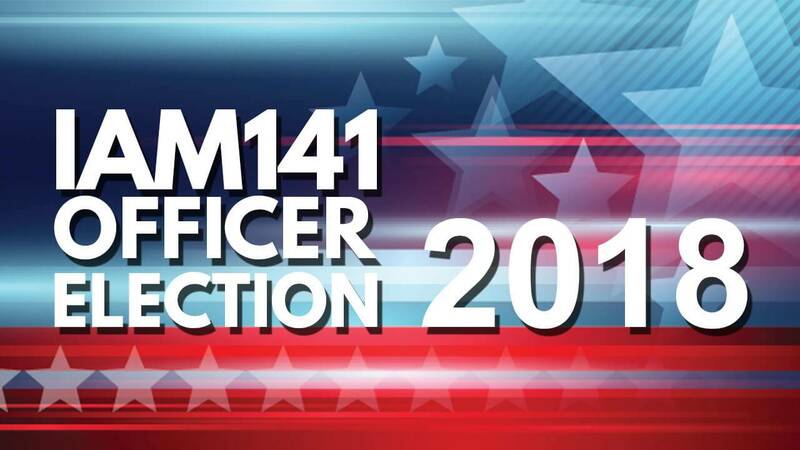 The DL 141 Secretary Treasurer and the Election Supervisor will confirm each member’s eligibility for an absentee endorsement ballot or general election ballot and mail a ballot and instructions as they are received and verified. If, in the judgment of the District Secretary Treasurer the member is not entitled to vote by absentee ballot, the member will be so notified, in writing, as soon as possible but no more than 10 days after receipt of the request for an absentee ballot. All requests denied shall be reviewed by the DOL OLMS Election Supervisor. Upon the closing of the polls, the local lodge inspectors of election shall tally the ballots (with DOL representatives, if present.) If contested, the AGC race will have a “Must VOTE for 24” provision that will be enforced. For the Assistant General Chair (AGC) positions, failure to vote for 24 candidates will invalidate all of the votes cast for AGCs on that ballot. Votes cast for candidates will be counted if the voter’s intent can be determined. A ballot that contains any marking that may identify the voter will be voided in its entirety. At the conclusion of the local lodge ballot tally, the local lodge will place all ballots (voted, spoiled, and unused), challenged and unresolved challenged ballots, and tally sheets in sealed containers or envelopes and send them to DL 141. Resolution of remaining local lodge challenged ballots and the tally of absentee ballots will be conducted under OLMS supervision at DL 141, Elk Grove Village, IL. On a date yet to be determined, containers received from the local lodges will be opened in the presence of observers. The DL 141 election tellers and OLMS election supervisor or representatives shall have full charge of the counting of the ballots, assisted by such help as they may require, to be furnished by the general secretary-treasurer. The nominees receiving the highest number of votes for the respective offices shall be declared duly elected, subject to the issuance of the DOL certification of the results. In the event of a tie, there will be a recount and if necessary, a coin toss to determine a winner in compliance with DL 141 Bylaws, Article VIII, Sect. 12.h. The LMRDA requires that all candidates be treated equally regarding the opportunity to campaign. In addition, Section 401(g) of the LMRDA provides that any money received by the IAM Grand Lodge, or any other labor organization by way of dues, assessments, or similar levy, or monies of any employer may not be used directly or indirectly to support the candidacy of any person in a union officer election. This prohibition extends to equipment, office supplies, records, newsletters, personnel, and any other financial or in- kind resources of IAM or any other labor organization and of any employers, whether or not they employ IAM members. Accordingly, union officers and employees may not campaign on time paid for by the union. Candidates and their supporters must campaign on their own time. They may not distribute campaign literature during their work hours or leave his/her assigned work area to distribute literature. If a candidate or supporter is in a pay status with his/her employer or the union, he/she should not be campaigning. If a candidate or supporter campaigns to a member, the member should be on his/her own time. The member should not be in a pay status with the employer or the union. Candidates and their supporters should not use their union position to access employer facilities to campaign. Candidates and their supporters may only hand out campaign literature in non-work areas (break rooms, locker rooms, lunch rooms, outside gates) or as permitted by the employers’ rules. No one assisting in the administration of the voting should distribute any campaign literature or lists of preferred candidates, nor wear any campaign buttons or clothing that indicates support for any candidates. Candidates, their supporters, and all other persons must refrain from sending campaign- related e-mail from e-mail addresses provided by any union or any employer. This use of e-mail violates Federal law governing union officer elections. Campaign-related e- mail may be sent from private, non-employer supplied e-mail addresses. The same applies to the use of employer telephones to promote a candidacy. Campaign-related phone calls may be made from private, non-employer and non-union-supplied phones/phone numbers. Candidates and their supporters may not use any union list of grand lodge, district lodge, or local lodge members’ names and/or addresses to distribute campaign literature via mail or e-mail except for the lists provided through the third party vendor. This includes lists that were created or obtained by candidates or their supporters in their capacity as union officers or employees. If a member or candidate intends to campaign with an e-mail list, the member or candidate should contact the election supervisor prior to sending the e-mail to discuss how the e-mail addresses on the list were obtained. Section 401(e) of the LMRDA provides that members may not be subjected to penalty, discipline, or improper interference or reprisal of any kind in the exercise of their right to support the candidate of their choice. If you witness any candidate, potential candidate, member, candidate supporter, or anyone else engaging in this type of activity, IMMEDIATELY contact the election supervisor and provide a detailed description of what occurred. Section 401(c) of the LMRDA provides that a union must comply with all reasonable requests by any candidate to distribute campaign literature at the candidate’s expense. Any candidate may request to use a DL 141 mailing list to distribute campaign literature to all or any portion of the membership or local lodges. DL 141 Secretary Treasurer Alex Gerulis is the point of contact for making requests for all campaign distribution (USPS and e-mail). The OLMS Election Supervisor should be carbon copied (cc’d) on all requests. Requests can be made by mail or e-mail. Campaign literature mail distribution will be done through Schiele Group, 1900 Arthur Ave., Elk Grove Village, IL 60007, attn. : Steven Gillis, V.P. National Sales. Cell 847-921-2182; fax 847-439-1883; office 800- 437-8417; e-mail sgillis@schielegroup.com. It will take the union up to five working days to collect and provide the address information to the printer, and the time for the print job depends upon its size and other variables. The printer should be contacted by the candidates for specific timeframes and pricing details. Candidates may also request to send campaign e-mails using the union’s e-mail list. This e- mail list consists of members who have voluntarily provided their e-mail addresses to the union and where the union uses those e-mail addresses to communicate with its members. This list does not include every member’s e-mail address. Any candidate who wants to send a campaign e-mail utilizing the union e-mail list should contact Secretary Treasurer Gerulis with a copy to the OLMS election supervisor. E-mail distribution will be done through Kelly Press, 1701 Cabin Branch Drive, Cheverly, MD 20785; Attn: Cindy Sutton, Phone 301-386-2800; e-mail csutton@thekellycompanies.com The union will charge $100.00 to collect and provide the mailing list to the vendor. The vendor will charge a set of fee of $440, and then a $0.02/address for distributing the e-mail. The vendor will accept text in PDF or Word. Section 401(c) guarantees the right of a candidate to have an observer at the polls and the counting of the ballots. Each candidate has the right to have one observer at each local lodge polling location. A candidate may not serve as his or her own observer or that of any other candidate at a local lodge polling location. Observers must be a member of the IAM, but need not be a member of the particular local lodge where he or she is observing. Candidates shall submit written requests to the DL 141 Secretary Treasurer identifying their chosen observer and location. Observers must introduce themselves to the inspector, advise him or her on which candidate’s behalf they are serving as observer, and sign in/out of an observer roster. Observers will be permitted to move freely around the polling location to observe the voting and tabulation of ballots, but they must not interfere with or disrupt the balloting process, and under no circumstances will observers be permitted to handle ballots. Observers may not engage in campaigning, for example by wearing campaign apparel or distributing literature, and they should refrain from speaking with voters. Section 401(e) of the LMRDA requires that DL 141 must publish the results of the election in a manner calculated to reach the entire membership. The final election results will be posted on the DL 141 website within 24 hours following the conclusion of the final tally. The DL 141 bylaws effective September 1, 2017, Article VIII, Section 12(g), also states that DL 141 ST will have the signed reports e-mailed to each candidate. The DL 141 bylaws effective September 1, 2017, Article VIII, Section 13, elected candidates are installed into office at the regular Convention or in the Grand Lodge Transportation Conference at a Board meeting in October. The installation date has yet to be determined. Section 401(e) of the LMRDA requires that all nomination and election records be preserved for one year. Any member in good standing may protest the supervised election for valid cause; such protest should be made directly to the Election Supervisor in writing at any time before, during or within 10 days after the election i.e. completion of the ballot tally. For this election only, the Machinists internal election protest procedures will NOT apply. In conclusion, it should be clearly understood that all phases of the nominations and election for DL 141 officers are subject to Department of Labor supervision. No aspect should be conducted without prior consultation with and approval by the Election Supervisor or her designated representatives. It should also be noted that the above rules and regulations are not all inclusive. Additional election rules or clarifications may be promulgated by the OLMS election supervisor as needed during the election period. Below are the rules regarding campaigning for the 2017 International Association of Machinists (IAM) Grand Lodge officer election. These rules apply to all candidates, members and candidates’ supporters, even if the candidate is unaware of their supporters’ actions. No monies received by the IAM, its affiliates (including district lodges and local lodges), or any other labor organization, or monies of any employer (whether or not they employ IAM members) may be used directly or indirectly to support or attack the candidacy of any person in a union election of officers. Union or employer equipment (including copiers, computers, printers, fax machines, telephones, e-mail), office supplies, facilities, cash, or any other financial or in-kind resources may not be used to promote or attack any candidate. This prohibition includes the creation and duplication of campaign literature. The use of the IAM logo is prohibited in campaign material. Campaign e-mails cannot be sent from union or employer e-mail accounts. Campaign telephone calls cannot be made from union or employer telephones. Union telephone lists cannot be used for campaigning. Union e-mail lists cannot be used for campaigning (except through the election supervisor). If a member or candidate intends to campaign with an e-mail list, the member or candidate should contact the OLMS election supervisor prior to sending the e-mail to discuss how the e-mail addresses were obtained. Union or employer websites, social media, newsletters, newspapers and other communications may not be used to promote or attack any candidate. Local lodge officers and members are not to encourage support for or attack any candidate or group of candidates while discussing official union business during local union membership meetings. Campaigning and distributing campaign literature is allowed before and after membership meetings, during union social events, and during the “good and welfare” portion of membership meetings, as long as it is not prohibited by the local lodge’s bylaws or practices and each candidate or member is allowed equal time and access to campaign. Candidates and their supporters are not allowed to campaign while on union or employer time. If a candidate or a supporter campaigns to members, the members should not be in a pay status with the employer or the union. Campaigning is prohibited during local lodge, district lodge, and grand lodge training events or staff meetings. Campaigning is allowed before and after these events. Candidates and their supporters should observe all applicable employer regulations regarding posting campaign literature and campaigning at worksites. Candidates and supporters should not use their union position to access employer facilities to campaign. Candidates and their supporters must pay full market price for all campaign related services unless a similar discount is given to all customers in the normal course of business. Receipts must be kept for all campaign purchases. Contact the U.S. Department of Labor, Office of Labor-Management Standards Election Supervisor Geneva Ferrando at (202) 513-7309 or olmselectionsupervisor@dol.gov with any questions or if you need clarification on any of these rules. If you witness any candidate, potential candidate, supporter, member, or anyone else engaging in any prohibited campaign activity, immediately contact the election supervisor.